Undefeated welterweight world champion Floyd Mayweather has started the promotion his Sept. 12 fight against Andre Berto, defending his less than popular choice for his supposed final opponent and also throwing in a shot but praising UFC Women's Bantamweight Champion Ronda Rousey. Last month at the ESPY’s, Rousey, who won the ESPY for Best Fighter, was upset that Mayweather said he didn't know who she was and took the chance to comment at his domestic violence record. Mayweather (48-0, 26 KOs) complimented Rousey during an interview on ESPN, offering his congratulations to Rousey and the MMA, saying she deserved the ESPY award this year. Mayweather has won six ESPYs for best fighter. 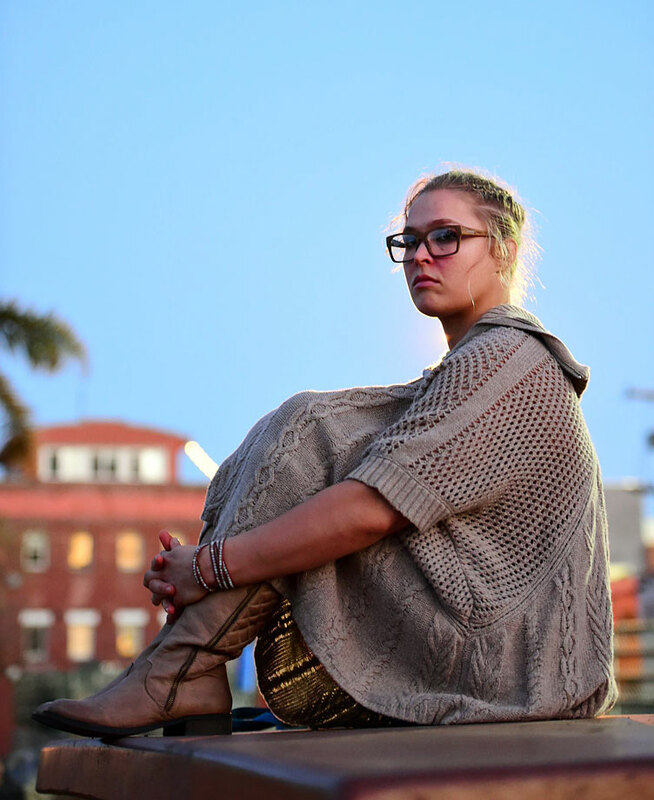 Here are some candid and not so candid photos of UFC fighter Ronda Rousey, who hosted Saturday Night Live on Jan. 23. In this sketch she appears with Taran Killam as Dan. Kenan Thompson and Ronda Rousey during the City Council sketch on the Jan. 23, 2016 episode of Saturday Night Live. Ronda Rousey with SNL participants (from left) Jon Rudnitsky, Bobby Moynihan, Selena Gomez, Rousey, Aidy Bryant, Vanessa Bayer and Jay Pharoah during the monologue. Singer Selena Gomez, Ronda Rousey, and Cecily Strong are caught on stage in a practice for the Jan. 23 Saturday Night Live show. 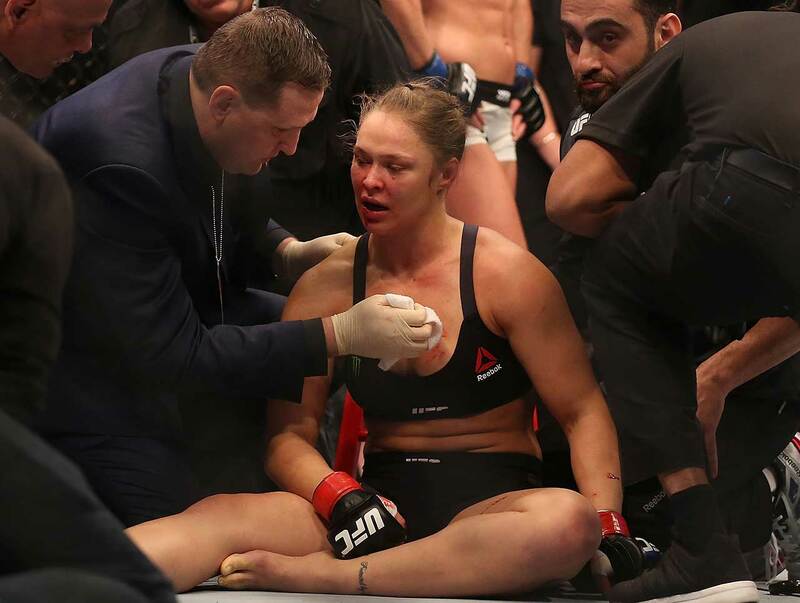 Ronda Rousey is attended to after suffering a second-round knockout at the hands of Holly Holm at UFC 193 in Australia. Ronda Rousey responds to questions during media day in Glendale, Calif., ahead of her showdown with Holly Holm. Rousey hosts Media Day ahead of her Nov. 14 fight in Australia. Ronda Rousey spars with a partner during a media training session. Rousey poses in front of a mural created in her honor in Venice, Calif.
Ronda Rousey poses for a photo at the London NYC hotel ahead of UFC 193. 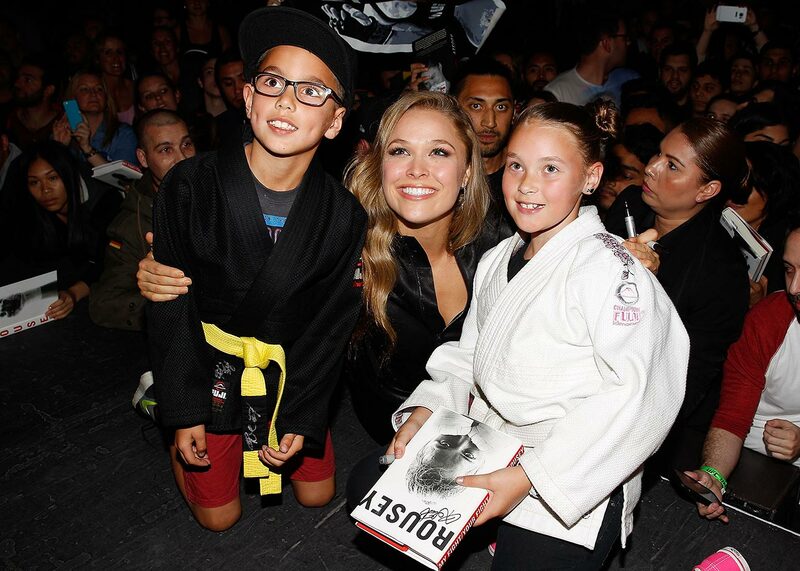 Ronda Rousey poses with a fans during a UFC 193 Sydney fan event. 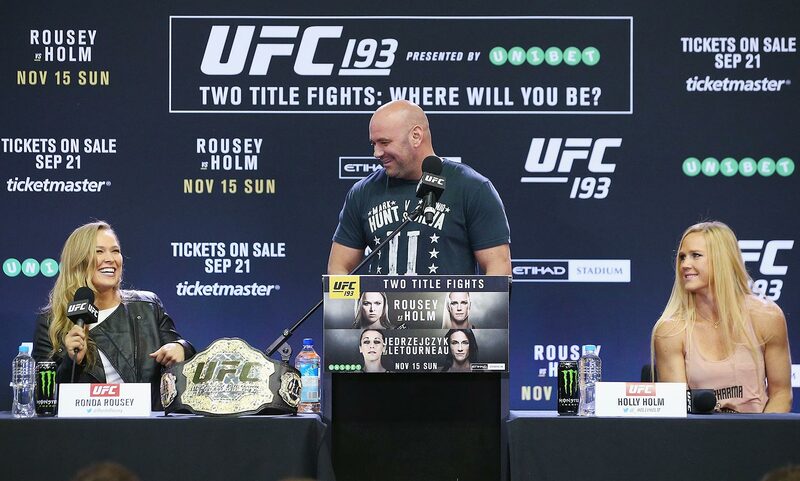 Ronda Rousey and her November opponent, Holly Holm, take centre stage during a UFC 193 media event. Ronda Rousey takes selfies with fans during a UFC 193 media event at Etihad Stadium in Melbourne, Australia. 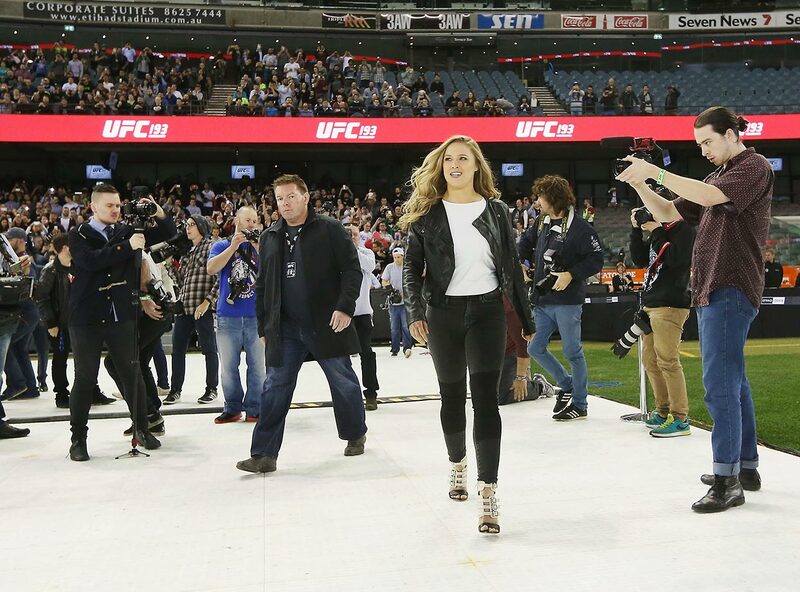 Ronda Rousey arrives during a UFC 193 media event at Etihad Stadium. 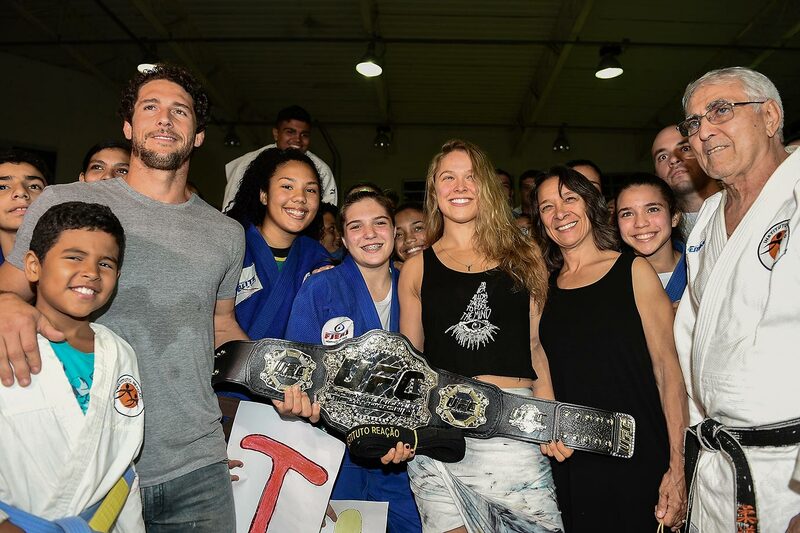 Ronda Rousey and her mother, AnnMaria De Mars (3rd from right), present a championship belt to a judo school and social project owned by Olympic bronze medalist Flavio Canto in Rio de Janeiro, Brazil. 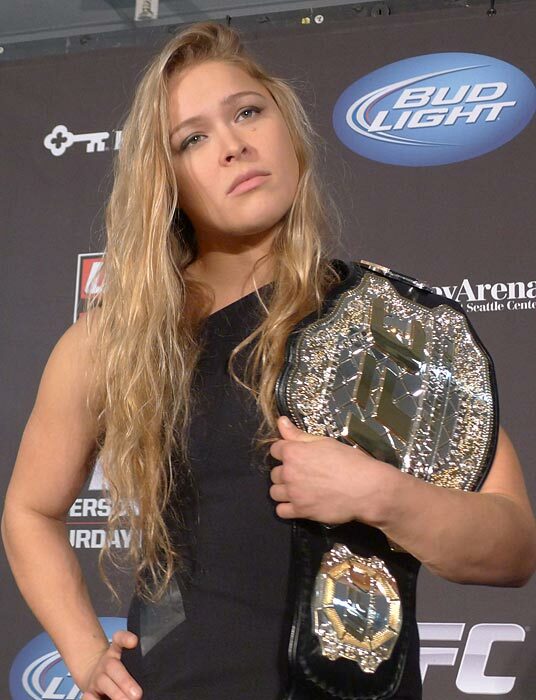 Ronda Rousey after her 34-second victory over Bethe Correia. Ronda Rousey and Bethe Correia at their weigh in. Ronda Rousey accepts the Best Female Athlete award during The 2015 ESPYS at Microsoft Theater in Los Angeles. 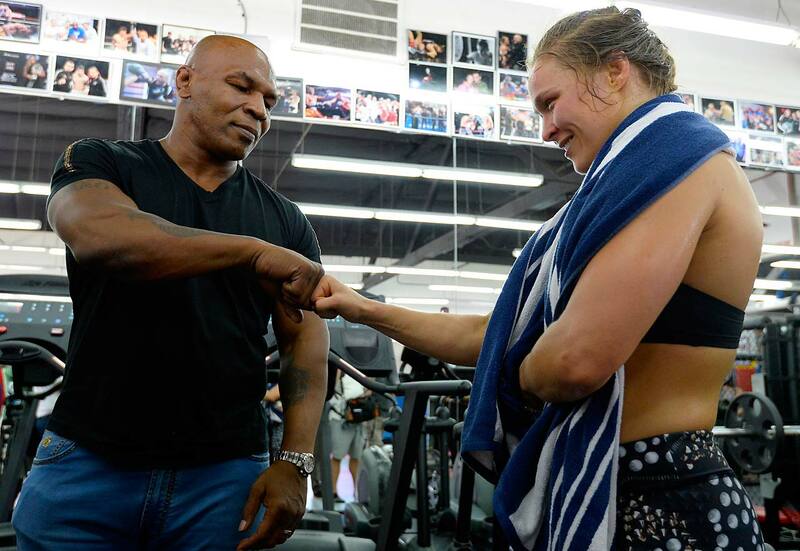 Former boxer Mike Tyson meets Ronda Rousey during a media training session at the Glendale Fight Club. Ronda Rousey poses during a photo shoot for SI in Los Angeles. Ronda Rousey trains during a photo shoot for SI in Los Angeles. Ronda Rousey talks with reporters after meeting with New York Gov. Andrew Cuomo and state leaders urging them to join the 49 other states in legalizing mixed martial arts. 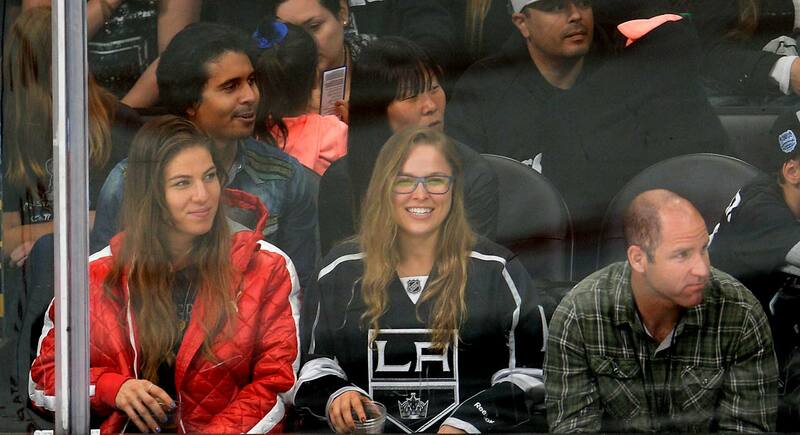 Ronda Rousey attends an NHL game between the Los Angeles Kings and the Colorado Avalanche. Rousey arrives at the 'Furious 7' Los Angeles Premiere at TCL Chinese Theatre IMAX in Hollywood. 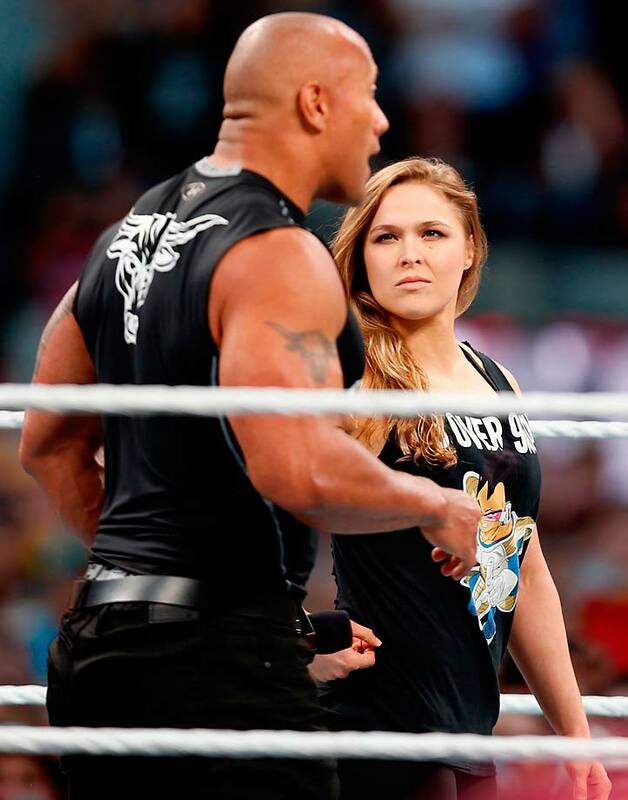 Ronda Rousey and the Rock at WrestleMania 31. 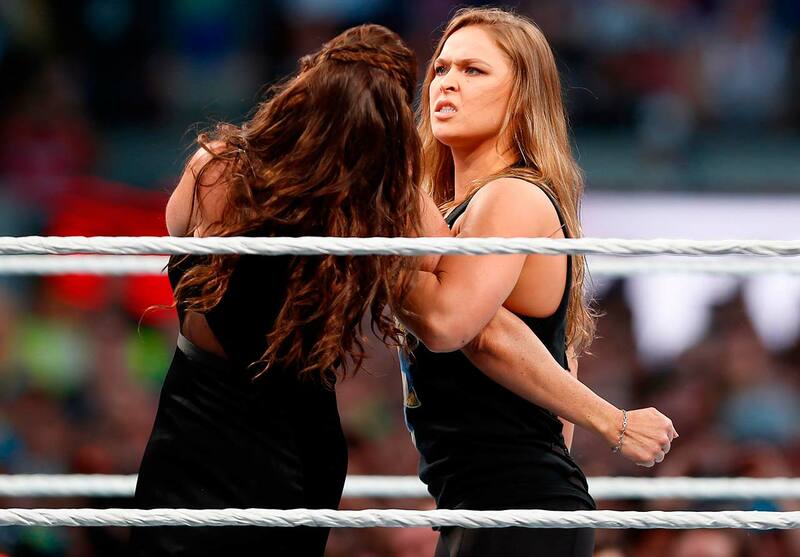 Ronda Rousey and Stephanie McMahon at WrestleMania 31 in Santa Clara. 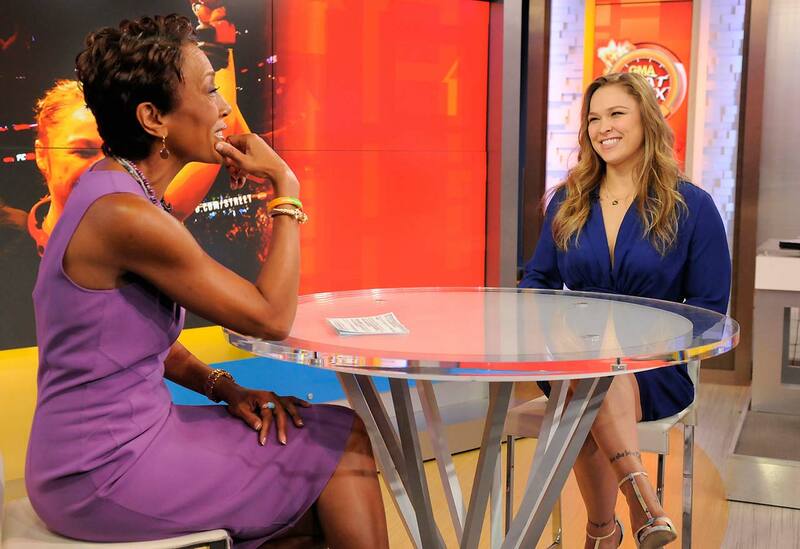 Ronda Rousey and Robin Roberts on the "Good Morning America" set. Ronda Rousey during her visit to "The Tonight Show Starring Jimmy Fallon" at Rockefeller Center in New York City. Ronda Rousey shows Jimmy Fallon what an armbar is during her visit to the "The Tonight Show Starring Jimmy Fallon." Ronda Rousey and Bethe Correia of Brazil face off during the 189 World Media Tour Launch press conference in Rio de Janeiro. Ronda Rousey and Bethe Correia of Brazil pose for the media during the 189 World Media Tour Launch press conference in Rio de Janeiro. Ronda Rousey poses for the media during the UFC 189 World Media Tour Launch press conference in Rio de Janeiro, Brazil. 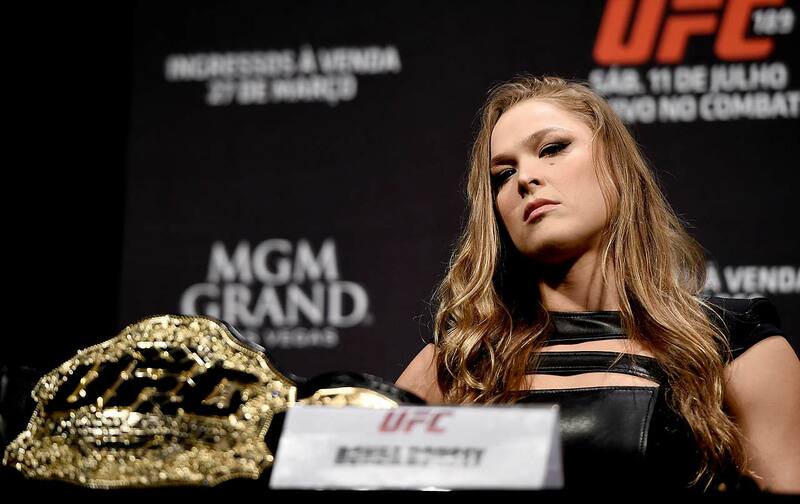 Ronda Rousey looks on during the UFC 189 World Media Tour Launch press conference in Rio de Janeiro. Ronda Rousey speaks during a South by Southwest Sports panel at the Austin Convention Center in Texas. Ronda Rousey is seen with Mario Lopez of Extra at Universal CityWalk in Los Angeles. Ronda Rousey speaks to members of the media at the Glendale Fighting Club ahead of her fight against Cat Zingano. Ronda Rousey and Cat Zingano face off during the UFC 184 Ultimate Media Day in Los Angeles. 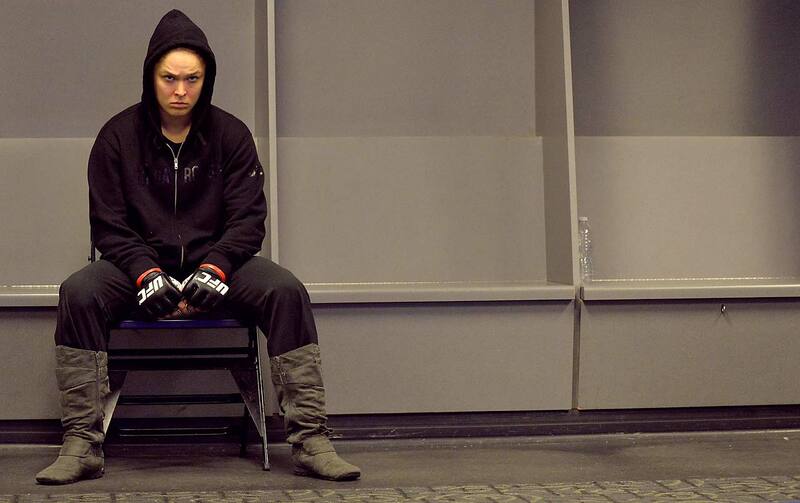 Ronda Rousey warms up in the locker room before her bout against Cat Zingano in Los Angeles. 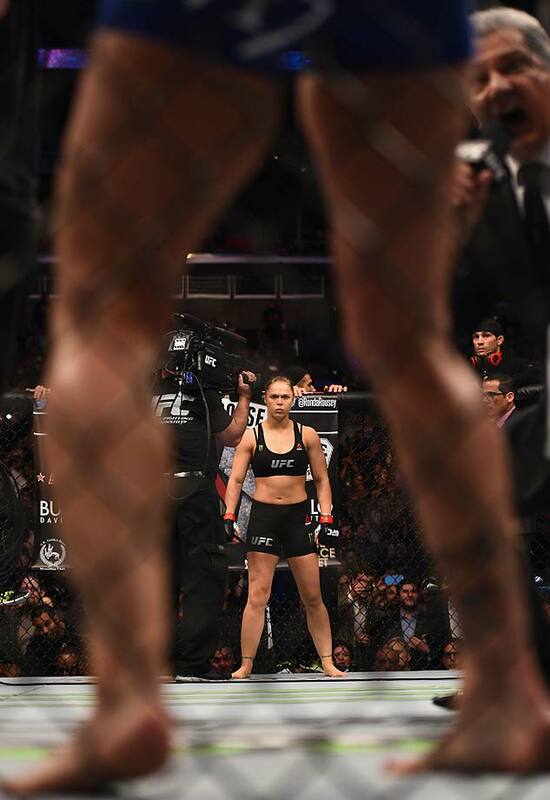 Ronda Rousey prepares to enter the Octagon in her bantamweight championship bout against Cat Zingano in Los Angeles. 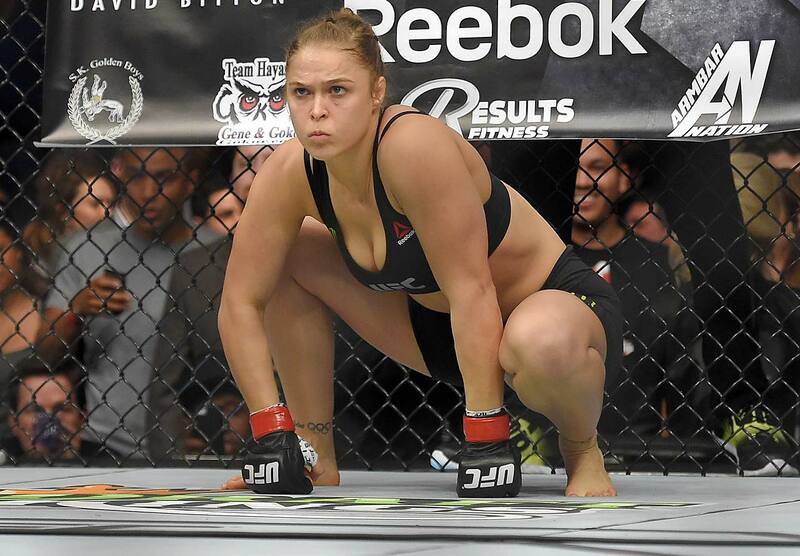 Ronda Rousey gets ready to fight Cat Zingano at UFC 184. 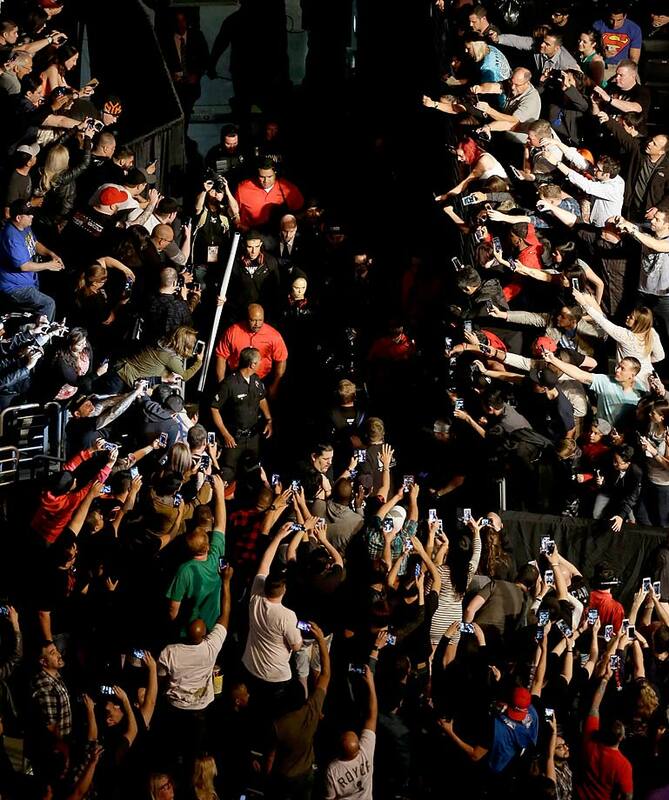 Ronda Rousey enters the Octagon in her bantamweight championship bout against Cat Zingano in Los Angeles. 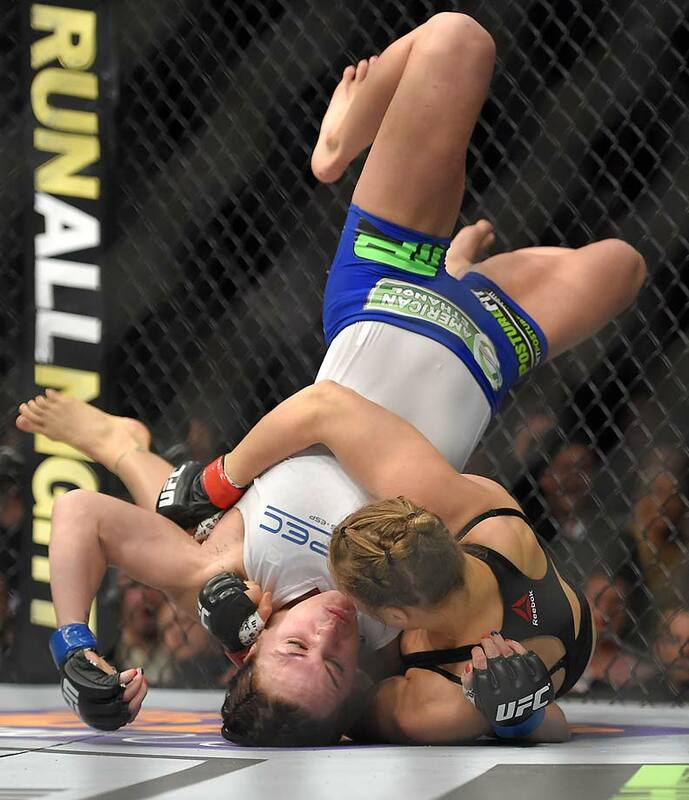 Ronda Rousey grapples with Cat Zingano during UFC 184. Rousey won after Zingano tapped out 14 seconds into the bout. 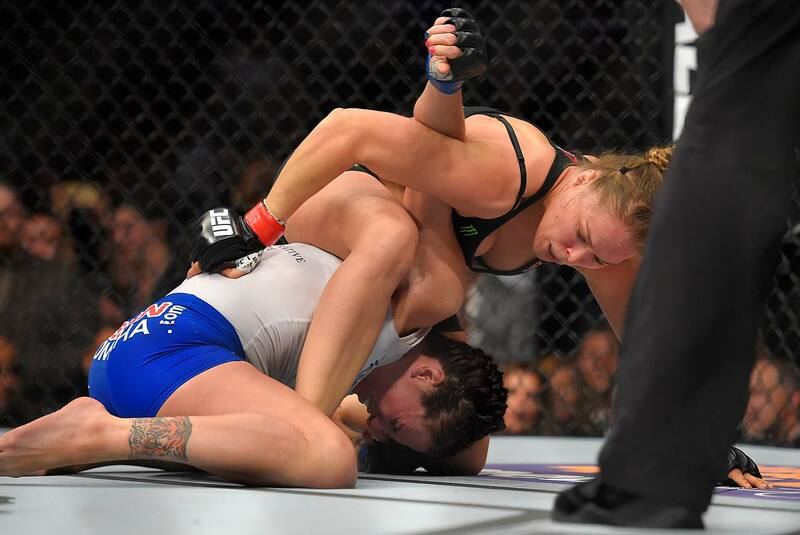 Ronda Rousey gets into position to put an armbar on Cat Zingano during UFC 184. Ronda Rousey puts the finishing touches on Cat Zingano to remain undefeated. 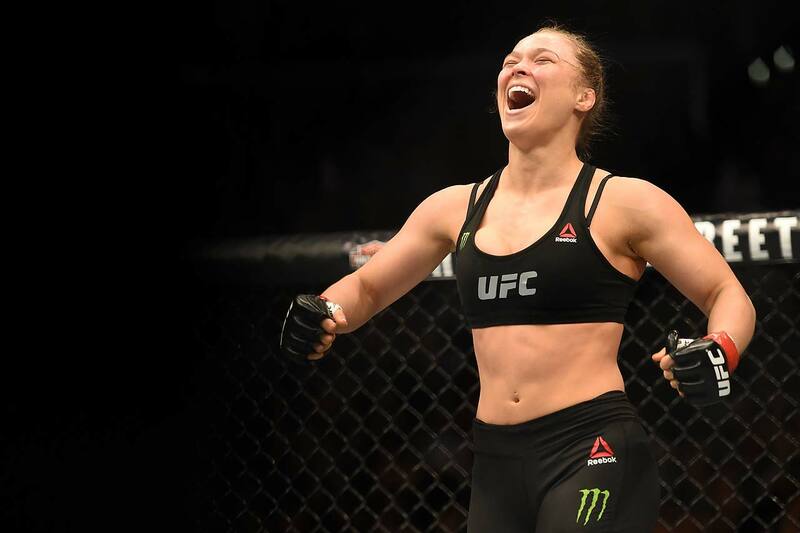 Ronda Rousey celebrates her victory over Cat Zingano. 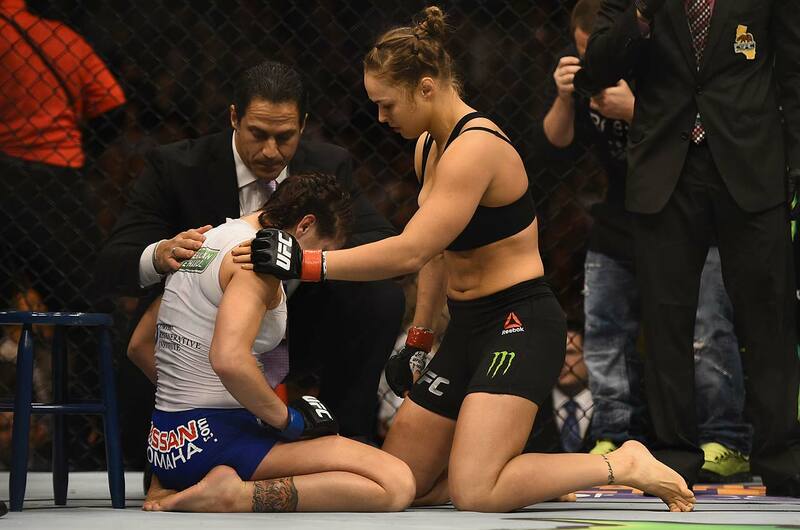 Ronda Rousey consoles Cat Zingano after their bout. Ronda Rousey attends Reebok and UFC Long-Term Partnership Announcement at Industria Studios in New York City. Ronda Rousey is seen at 'Jimmy Kimmel Live' in Los Angeles. 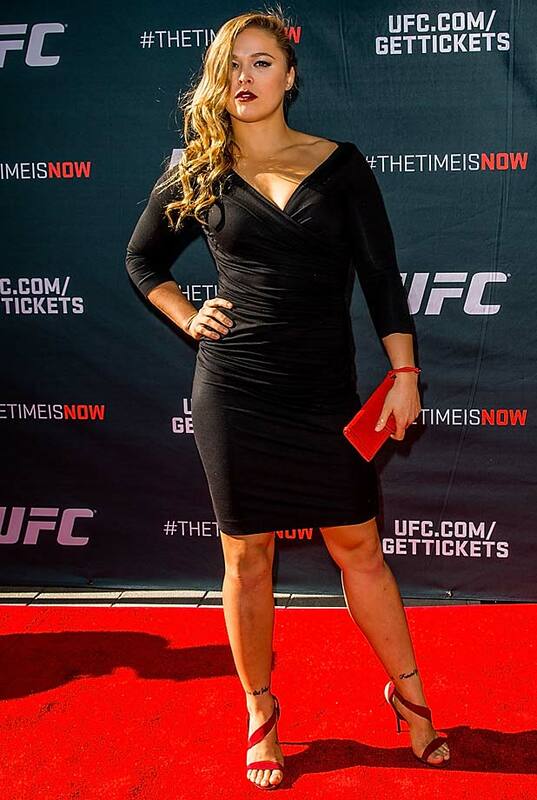 Ronda Rousey arrives at the UFC Time Is Now press conference in Las Vegas. Ronda Rousey sighting in West Hollywood, Calif.
Ronda Rousey attends FOX Sports 1's "The Ultimate Fighter" Season Premiere Party in Hollywood. Ronda Rousey arrives at the Los Angeles premiere of "The Expendables 3" in Hollywood. Ronda Rousey smiles at a weigh-in for the UFC 175 event at the Mandalay Bay in Las Vegas. Ronda Rousey faces off with Alexis Davis during the UFC 175 weigh-in inside the Mandalay Bay Events Center in Las Vegas. Ronda Rousey takes down Alexis Davis during their women's mixed martial arts bantamweight title bout at UFC 175 in Las Vegas. Kelsey Grammer, Arnold Schwarzenegger, Ronda Rousey and Sylvester Stallone pose during a photocall for "The Expendables 3" at the 67th edition of the Cannes Film Festival in Cannes, southern France. Arnold Schwarzenegger kisses Ronda Rousey during a photocall for the film "The Expendables 3" at the 67th edition of the Cannes Film Festival. Ronda Rousey attends a photocall for "The Expendables 3" at the Carlton Hotel in Cannes, France. 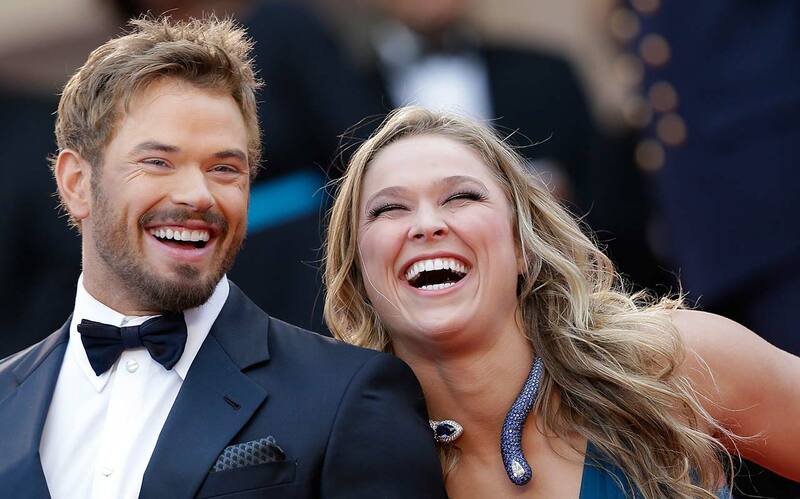 Actor Kellan Lutz and Ronda Rousey arrive for the screening of The Homesman at the 67th international film festival. Ronda Rousey attends "The Homesman" Premiere at the 67th Annual Cannes Film Festival inFrance. Ronda Rousey hosts #TheLinkParty at the IceLink Boutique West Hollywood benefiting The Special Needs Network. 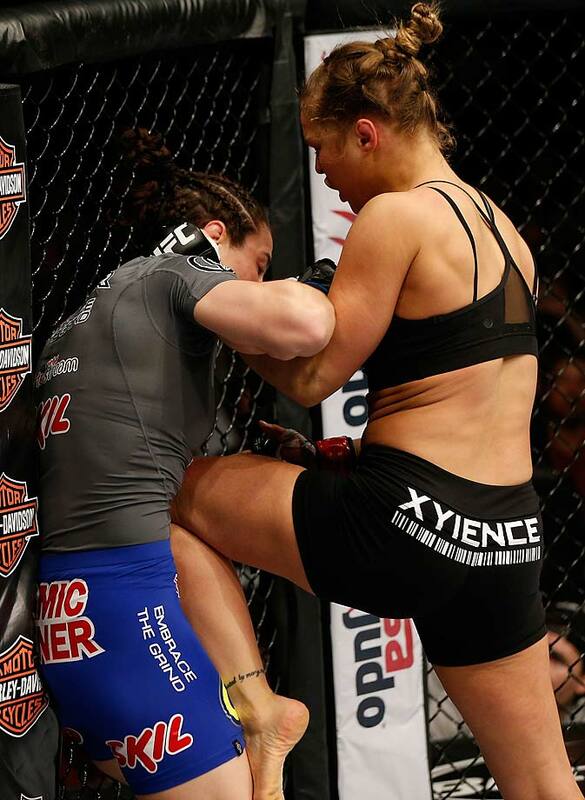 Ronda Rousey knees Sara McMann in their bantamweight championship bout during UFC 170 in Las Vegas. Ronda Rousey at an open training session for fans and media in Las Vegas. Ronda Rousey made an appearance on "Jimmy Kimmel Live" in early December 2013. Ronda Rousey poses for a portrait during a UFC photo session in Las Vegas. Ronda Rousey attempts to submit Miesha Tate in their UFC women's bantamweight championship bout during UFC 168 in Las Vegas. Rousey and UFC lightweight Josh Thomson pose for a photo during the UFC Fan Party in Las Vegas. 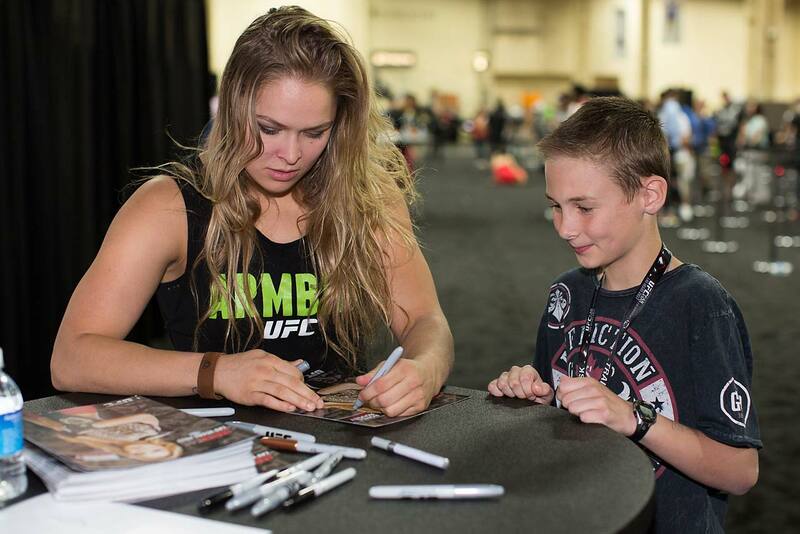 Ronda Rousey signs an autograph during the UFC Fan Expo Las Vegas 2013 at the Mandalay Bay Convention Center in Las Vegas,. Ronda Rousey attends the Fox Sports Media Group Upfront after party at Roseland Ballroom in New York City. 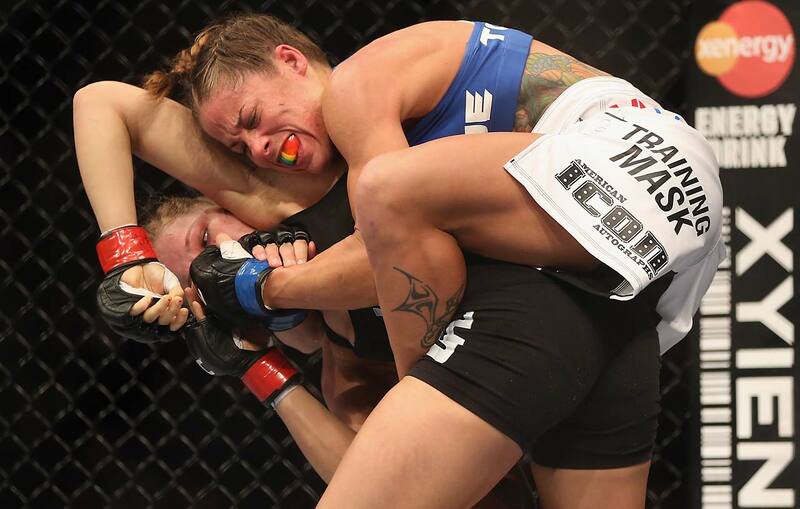 Ronda Rousey eventually got Liz Carmouche off her back and improved her record to 7-0 with the victory. Ronda Rousey found herself in trouble early against Liz Carmouche, but withstood the challenge to win in the first round. 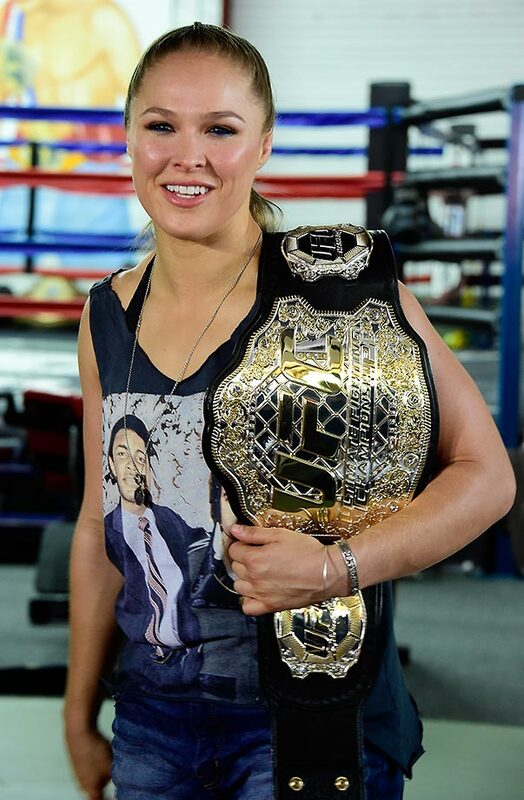 Ronda Rousey shows off her UFC bantamweight championship belt during a news conference in Seattle, Wash. UFC president Dana White handed out the belt, saying the former Strikeforce title-holder will make her UFC debut on Feb. 23 against Liz Carmouche. 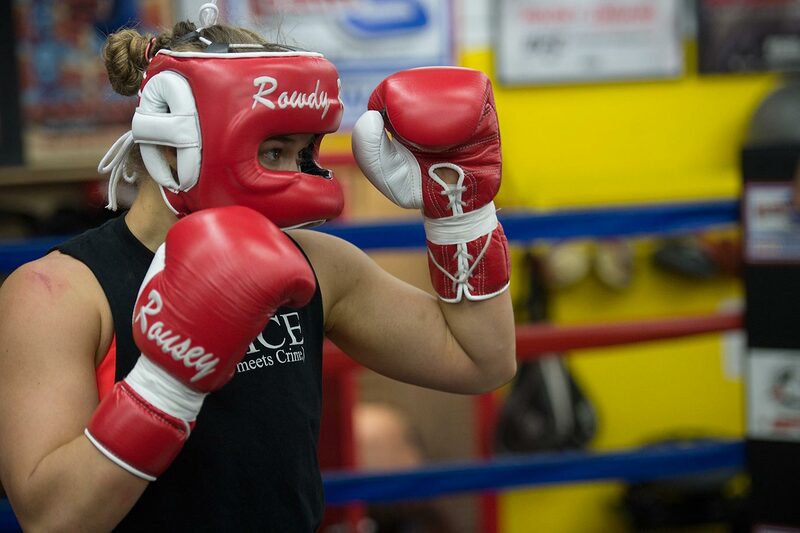 Ronda Rousey during training session with coach Edmond Tarverdyan at Glendale Fighting Club. Rousey poses with Dana White at the Sons of Anarchy season 5 premiere screening in Los Angeles. Ronda Rousey secures an arm bar submission against Sarah Kaufman during their Strikeforce bout. Ronda Rousey reacts after defeating Sarah Kaufman by submission during the Strikeforce event in San Diego on Aug. 18. Ronda Rousey attends ESPN Magazine's 4th Annual Body Issue celebration at Belasco Theatre on July 10, 2012 in Los Angeles. Ronda Rousey during the weigh-in for her bout against Meisha Tate. Ronda Rousey walks to the cage before her bantamweight bout against Tate in March. Rousey won via an armbar submission. Ronda Rousey reacts after submitting Meisha Tate during their bantamweight bout in Columbus, Ohio. 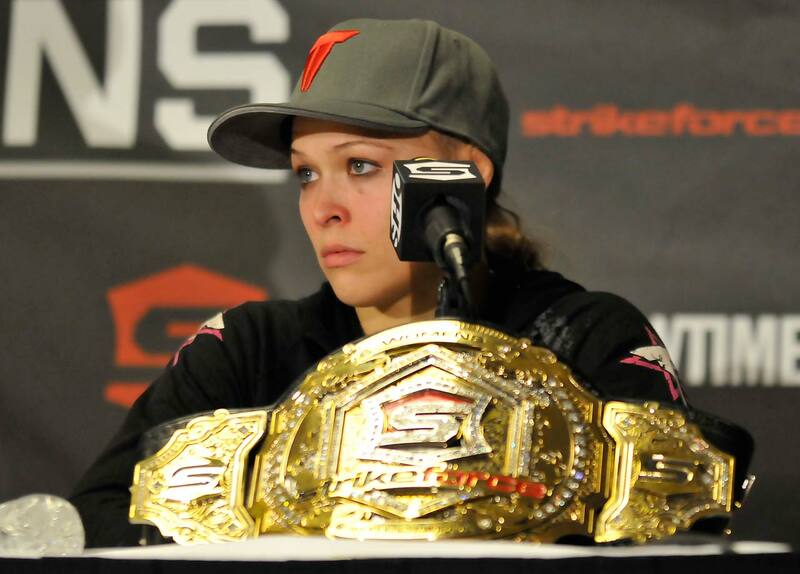 Rousey takes questions from the media after her victory over Meisha Tate. Ronda Rousey during a photo shoot for SI at the Glendale Fighting Club in California. 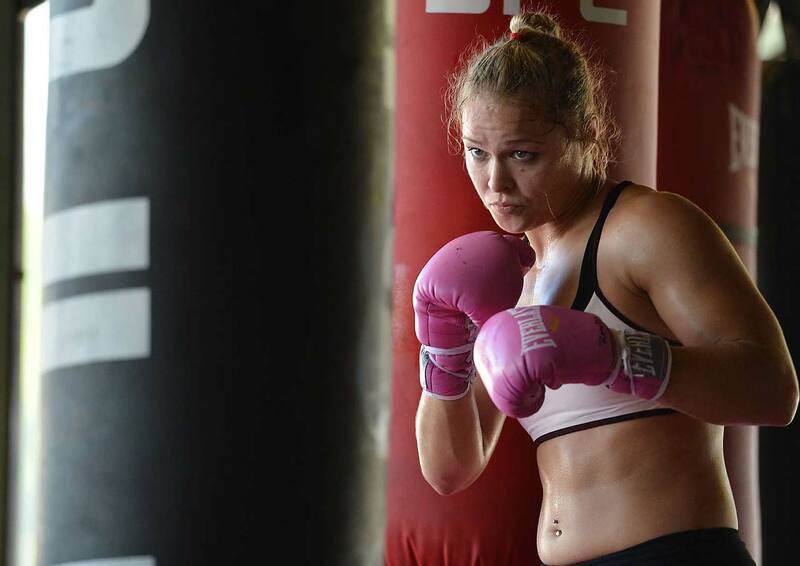 Ronda Rousey catches her breath after a workout. Ronda Rousey attends the UFC On FOX: Live Heavyweight Championship in Anaheim, Calif.
Rousey and Sarah D'Alelio pose at the weigh-in before their Strikeforce match in Las Vegas. Ronda Rousey during the Strikeforce Challengers 4 at The Pearl at The Palms Casino Resort in Las Vegas. Sarah D'Alelio and Ronda Rousey during the Strikeforce Challengers 4 at The Pearl at The Palms Casino Resort in Las Vegas. Rousey would win the bout via tapout in the first round. 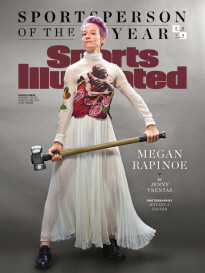 Ronda Rousey (far left) in a Summer Olympics preview portrait with Rau'shee Warren (boxing), Demetrius Andrade (boxing), Marci Van Dusen (freestyle wrestling), and Sarah Hammer (cycling). 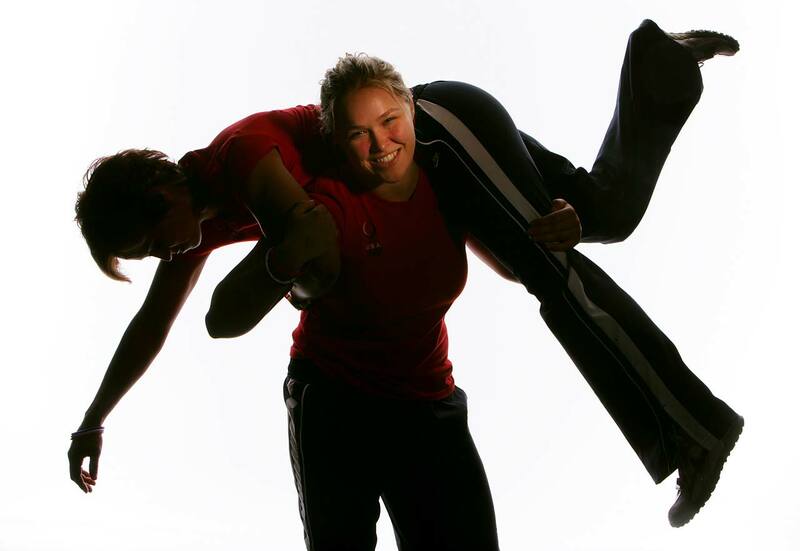 Ronda Rousey throws Valerie Gotay over her shoulder as she poses for a portrait during the 2008 U.S. Olympic Team Media Summitt in Chicago. 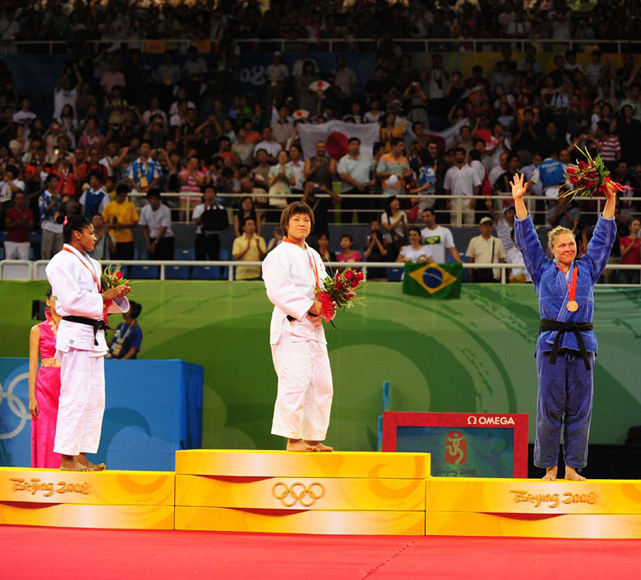 Rousey and Germany's Annett Boehm compete in the 70 kg judo bronze-medal match at the 2008 Beijing Olympic Games. Rousey would win the match and the bronze. Rousey stands on the podium after winning bronze at the 2008 Olympics. 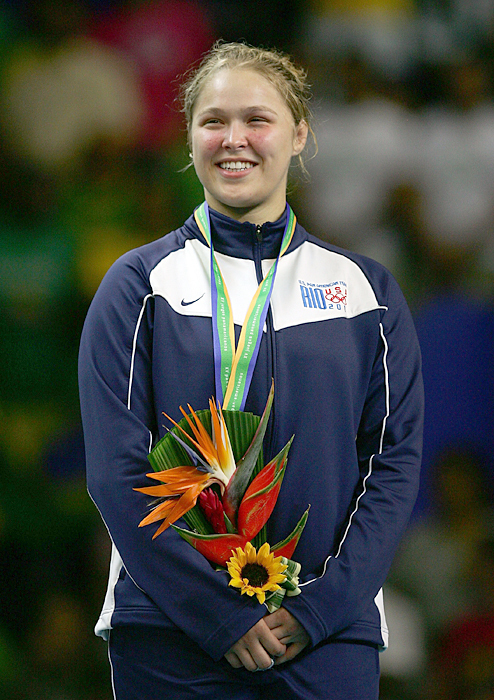 A happy Ronda Rousey after she won the 70Kg Judo final in the 2007 XV Pan American Games in Rio de Janeiro. 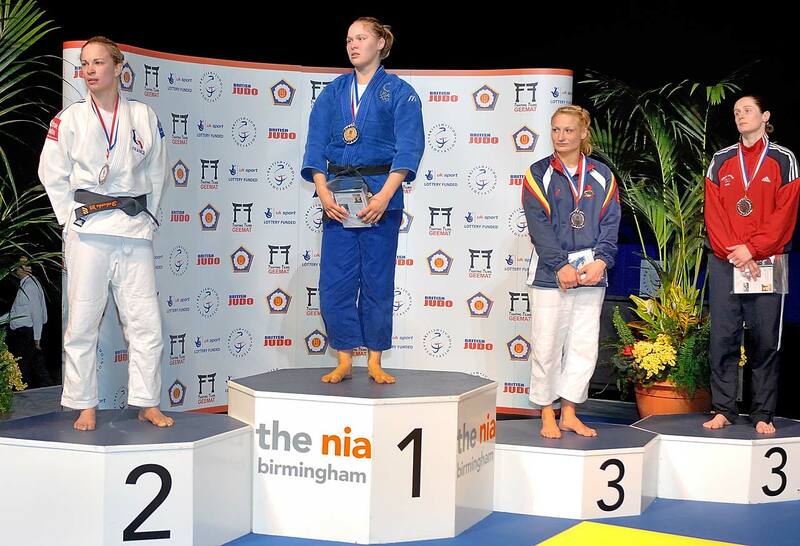 Ronda Rousey with her gold medal at the Fighting Films Birmingham Women's World Cup at the National Indoor Arena, Birmingham, England. Claudia Heill from Austria fights Ronda Rousey during the Judo half-middle weight (-63kg) event at the 2004 Olympic Games in Athens. Ronda Rousey and Anastasia Krivosta compete in their 63 kg. match during the U.S. Olympic Team Trials in Judo at the San Jose State University Event Center in California. Rousey won the match to move on in the competition. But when pressed about Rousey’s comments about him, Mayweather mentioned how much money he made this year. Rousey improved her record to 12-0 after a 34-second knockout over Bethe Correia at UFC 190. Mayweather’s bout against Berto (30-3, 23 KOs) is the last in his lucrative six-fight deal with Showtime/CBS that he signed in 2013. He has won each of previous five bouts by decision. “I don’t know why, but I’m just training a lot harder for this fight,” Mayweather said. 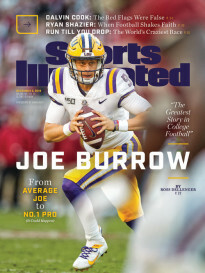 “I just want to go out with a bang, I guess. Mayweather last fought in May and earned a 12-round unanimous decision over Manny Pacquiao, retaining the WBA and super welterweight WBC titles and winning the WBO championship from Pacquiao. The fight broke pay-per-view and live-gate records and generated more than $600 million in revenue, but Mayweather was stripped of his World Boxing Organization belt after missing the deadline to pay the sanctioning body a $200,000 fee. The 31-year-old Berto last fought in March, scoring a sixth-round TKO over Josesito Lopez, winning the interim WBA Welterweight title. Berto is just 3-3 in his last six fights.